one whose authors didn't just admit where they got their inspiration. By the very title, they proclaimed it. And yet, during most of the strip's existence, the title was the only connection to the story it came from. Those authors were writer Bill Conselman and artist Charlie Plumb, neither of whom is known for other work in comics. The strip was distributed by United Feature Syndicate, which also handled Peanuts, Gordo, Twin Earths and many others. The daily version began June 1, 1925, and a Sunday page was added two years later. Ella was the stepdaughter of Myrtle "Ma" Cinders, a formidable woman who assigned Ella to the household drudge work while her own daughters, Prissie ("pinched and acid", to quote Conselman's description of his character) and Lotta ("fat and foolish") Pill spent their copious free time tormenting Ella. But Ella wasn't the sort to let that get her down. With her kid brother Blackie as an ally, she wisecracked her way through the most depressing of situations, finding solace in sarcasm. Outside the house, she had a boyfriend with the improbable name of Waite Lifter. She was pretty enough, in a 1920s sort of way, with straight, black hair and as big and bright a pair of eyes as you'll find anywhere in comics. But she wasn't a raving beauty, and tended to dress down, especially in the early years. Her "fairy godmother" moment did come in the form of winning a beauty contest, but that was only because the guy judging it picked her photo at random. The prize was relocation to Hollywood and a glamorous job at a movie studio. When she got there she found the studio defunct, but at least she was out of the "Cinderella" situation. For the next few years, Ella and Blackie kicked around Hollywood, doing melodramatic continuity in the dailies and one-episode gags on Sundays. She never really prospered, but did okay for herself — in fact, she even got married, tho her husband, Patches, spent a lot of time away, having adventures. In real life, Ella's entrance to Hollywood was more successful. Her movie was released on June 6, 1926, when the comic was only a year old. The producer (John McCormick Productions), director (Alfred E. Green), distributor (First National Pictures Inc.) and stars (Colleen Moore as Ella and Lloyd Hughes as Waite) didn't have another toon connection among the lot of them. 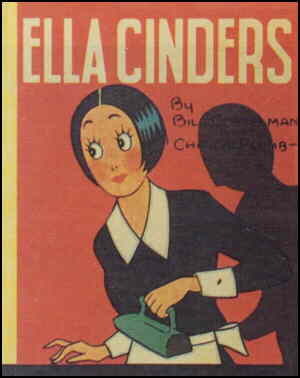 Other than that, Ella's only excursions off the newspaper page were a handful of Big Little Books during the 1930s and a few scattered comic books from the late '30s to the late '40s — back pages in early issues of United Feature's Tip Top and Sparkler Comics (where Nancy, Li'l Abner and Tarzan were the stars), five issues under her own logo in 1948 and '49, and a few miscellaneous items. Conselman and Plumb continued to share credits until Conselman's death in 1940, after which Plumb took sole credit. But that doesn't mean he did the whole job. In fact, he became well known for hiring the work out. His ghosts over the years, in both writing and art, included Hardie Gramatky (also a children's author and Disney animator), Henry Formhals (Freckles & His Friends) and Jack W. McGuire (The Red Knight). The steadiest and best known was Fred Fox, who took over the feature when Plumb retired in the 1950s. Fox was later replaced by Roger Armstrong (Scamp). By that time, Ella was looking rather dated — despite the fact that her hairdo had been updated decades earlier, to include curls. The strip ended in 1961. Text ©2004-08 Donald D. Markstein. Art © United Feature Syndicate.